In other posts I’ve discussed my preference for self-hosted blogs over ones that are stored on a free public platform. In the long run, there’s just no comparison. Under most circumstances, any business or personal brand should have its own hosting. Put another way, it’s better to own than to borrow. That said, there are a couple of situations where I can see the value of creating a blog on the free Blogger platform offered by Google. One reason might just be “for practice.” In other words, a person might want to try his hand at blogging before committing to it long-term. And that’s fine. The only caution I’d give is that try to make that decision as soon as possible. If blogging is not for you, then no harm done and nothing lost. However, if you decide to continue to grow your blog audience and perhaps even use it as a vehicle for other goals, then you’ll need to switch over to a self-hosted site sooner rather than later. It’s generally accepted that Google and other search engines really love self-hosted WordPress blogs. But let’s reiterate the fact that free blogging platform at WordPress.com is NOT the same thing as the open-source software available on WordPress.org for self-hosted sites. WordPress.COM is a free blogging platform (and perhaps not the best one). WordPress.ORG is open-source software used to create a blog on a self-hosted server. 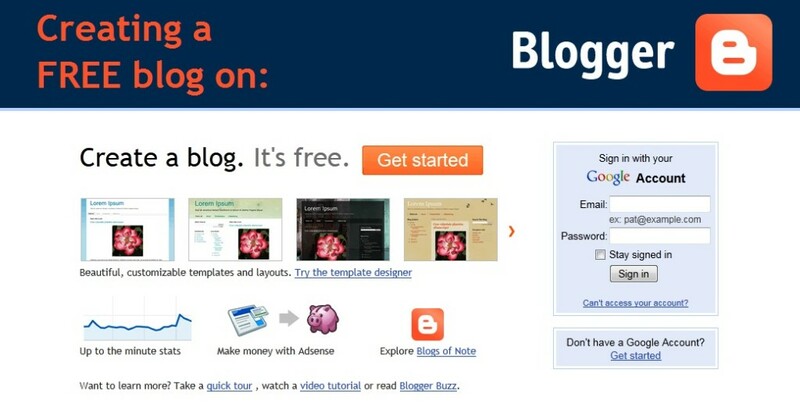 You might ask, “What’s so bad about the free blogging platforms? But if this is something that you’d like to play around with, check out my video that shows you the exact steps in creating a blog on the free Blogger platform. It’s very quick and easy. And fun, in all honesty. In about 15-20 minutes you can have your first post visible on the Internet for the whole world to read. Hey Rick! I had to come back and revisit this topic. I know we discussed it in class, but I feel like I would like to step out and do the self-hosting, but I also feel like I am still in the “practice” stage of blogging and not 100% sure of it. I guess I need to get clear on my vision of where I want to take this. Your a great teacher. Thank you for your time both here and in class! Thanks so much for your kind words, Adam. I think you’d really like the self-hosting platform better once you got past the learning curve. Keeping practicing on Blogger for now, and in a couple of weeks I’m going to have a “troubleshooting” session to help get everyone squared away. You’re doing GREAT so far!